Even though the media is full of miracle solutions and treatments, the only true ways to increase your breast size is by plastic surgery or gaining weight through body fat. With that said, there are, however, several ways to make them look larger. Millions of dollars are spent each year on undergarments, including push-up brassieres. However, you can naturally make your "girls" perkier and look lifted and bigger through chest exercises. The lying chest fly increases the strength in your chest muscles, making your breasts appear lifted and fuller. This exercise can also work to tone your abs. Begin by lying on your back with your knees, as well as your hips, at a 90 degree angle. Push your lower back into the floor with the assistance of your lower ab muscles. Put your arms out straight to your sides. With weights in your hands, slowly lift them until palms face each other. Do not lock your elbows. Slowly lower your arms back down until you touch your hands back down to floor. Repeat 10 times for 3 sets. 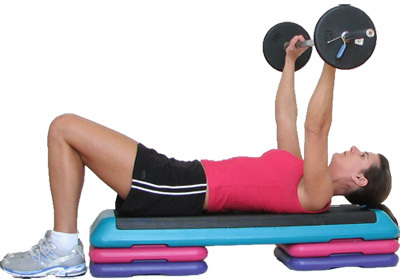 One of the best chest exercises for women for strengthening their pectoral muscles is the chest press in the bridge position. You can start this exercise without the bridge part and add it as you get stronger. Start by lying flat on a mat with your knees bent. You want to place your feet apart about hip width. Hold your weights to your chest. To get into the bridge position, you want to lift your pelvis upward to the ceiling, using your glutes to push. While holding this position, push the weights up and down towards the ceiling, directly over your shoulders. One of the simplest chest exercises for women to do to enhance their breast area is the push-up. Begin while on the floor in the plank position, with both your legs and arms straight. Position your shoulders over your wrists. As you bend your elbows, lower your body towards the floor. You have gone far enough when elbows and shoulders are lined up. Exhale as you go down, inhale as you straighten back up. If it is too hard to start with your legs straight, you can begin with knees bent. The lateral plank walk is a challenging exercise that gives proven results in toning your upper body and strengthening your chest muscles. Start in the plank position. With your body straight, place your hands lined up below your shoulders. Concurrently, cross your left hand to the right as you step your right foot to the left side. Then repeat the same movement with your right hand and left foot. Return to your starting plank position. Your pelvic area should be kept level and hold your abs pulled in. After doing these movements three times, you have completed one rep. When doing second rep, reverse directions. Many describe the barbell bench press as one of the best chest exercises for women who want to build muscle and give lift to their breasts. Lie on the bench in position, placing your head under the weight bar and feet flat on floor. Grab and hold the bar a little wider than your shoulders and lift it while squeezing your gluteal muscles. Your whole body should be flexed. Lower the bar till it almost touches your chest and then lift back to raised position. Medicine balls are commonly used to workout abs, but can be used as a tool for strengthening your chest muscles, too. Lie down flat on the ground or on a mat. While holding a medicine ball, let your elbows touch floor while at a 90 degree angle. Make sure the ball weighs enough to challenge your strength. Quickly throw the ball upward and when catching it, pull the ball inward to your chest. This exercise directly targets your pecs, toning and strengthening this area of muscle. While standing at the exercise machine, hold a high pulley cable in each hand. Move your right foot back while slightly bent over, using your back leg muscles to stabilize. Pull cables so that your arms are hugging your chest. Return to the starting position. Repeat 10 reps up to 3 times. Similar to other chest exercises for women, this exercise strengthens your pecs and gives your breasts perkier appearance. 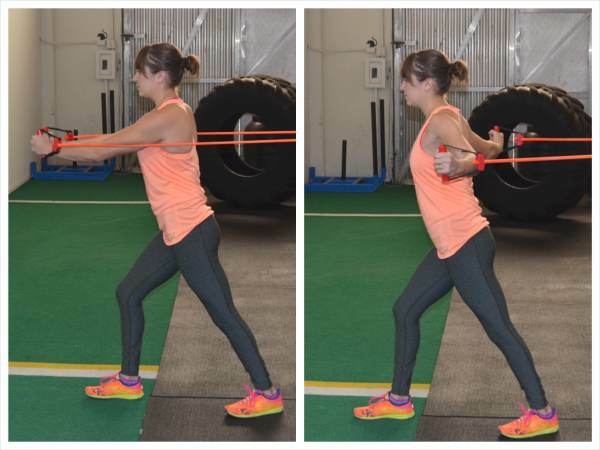 Attach a resistance band to a secure location, placing them at shoulder height. While standing, hold a handle with each hand. Take steps outward until you feel resistance. Slightly bend forward, yet keep your back straight. Lift your arms straight and then pull them outward. Once you have reached the full extent, pull your arms back inward. Flex your chest as your hands touch while still holding the bands. If you are seeking to strengthen and tone your chest, an effective way to keep your pecs tight and flexed is moving from plank to elbow plank. Start in the full plank position. Lower your left elbow to the floor, then your right one. This will put you in the elbow plank position. Place your left hand on the floor and straighten the left elbow. Do the same movement on the right to return to the original position. You can enhance the push-up chest exercises for women by using a medicine ball to set your arms at different heights. Begin in the plank position on the floor. Place your right hand on top of a ball. Keeping your body straight to the floor, do a push-up with one hand on ball and the other one the floor. You can bend your legs at the knee if too hard and work your way to straight legs. Do 5 times with right hand on ball and then repeat 5 times with left hand on ball.